/**/ The Purposeful Wife: Book Review: Eat That Frog! Book Review: Eat That Frog! 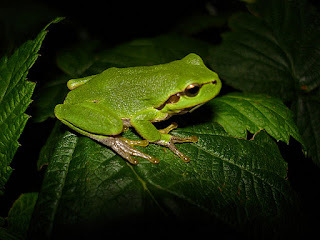 Right now I am eating my frog, and writing my post about Brian Tracy's Eat That Frog. Today is just one of those days when I feel blah. It is raining, I am severely lacking in the motivation department, and I didn't spend any time this weekend planning the week's posts. All I know is that I said I'd review this book this week, so it's a start I suppose. Blah. Here goes! The main point of this book is summarized in the title, based off a quote from Mark Twain, “Eat a live frog first thing in the morning and nothing worse will happen to you the rest of the day.” In his book Brian Tracy defines a frog as the most important thing you can accomplish, that you tend to put off because of its difficulty or overwhelming nature. Just do it! By doing the most valuable item on your list first thing each day, you will be making the best use of your time, be more productive, and become more successful. It is geared for business people, but I did find it encouraging for me in my role as a homemaker. Brian Tracy shares 21 tips to help you in your frog-eating. Making and living by to-do lists (a monthly, weekly and daily to help you keep short and long term projects in mind and organized), staying on task and focused, and doing things as quickly and well as you can, were the biggest helps I took from it. According to Mr. Tracy, if you accomplish your biggest and hardest task first, it will motivate you to continue accomplishing things. I was encouraged to stop complaining and just get moving. Maybe writing this review today was a timely reminder for my current mood :). The faster and more focused you work, the more you will get accomplished. Common sense :). And the more big and important tasks you accomplish, the happier you will feel, enabling you to enjoy down time with the people you love most, doing the things you most enjoy. The only thing to be wary of is his emphasis on self-esteem. My purpose in being "successful," or hard-working and productive, is ultimately for the glory of God, not to feel better about myself. With this in mind, I do believe there is a lot of good to be gleaned here! Ah! I needed that!!! My main frog-in-waiting is planning/scheduling/organizing my time and to-do's, like you mentioned (which involves lots of sub-categories of frogs!). But I did scrub the shower and bathtub today, which is a frog I normally avoid at all costs! It was rewarding, too; who knew it could get that shiny? !